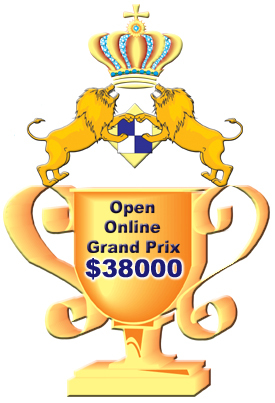 The Super Final Tournament of Online Grand Prix Open 2012 took place August 15. 8 players competed for the grand prize in a knockout tournament. The quarterfinal featured the following matches: Volkov - Safarli 0,5:3,5; Zubov - Kovalenko 3:1; Andreikin - Andriasian 2,5:1,5 and Grischuk - Amonatov 2,5:2,5. The semifinal results: Grischuk - Safarli 1,5:2,5 and Andreikin - Zubov 3:1. After 4 games of the final match between Eltaj Safarli and Dmitriy Andreikin resulted an a draw (2:2), an armageddon game was used as a tie-breaker. The game ended in yet another draw, and Dmitriy Andreikin - who played as Black and with less time - won the Super Final Tournament of Online Grand Prix 2012. Watch the games in our Tournaments & Broadcasts section.